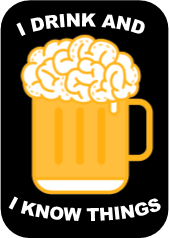 'I Drink and I Know Things' is a quote from my favorite character on my favorite TV show Game of Thrones. 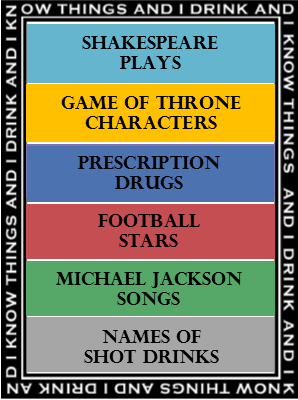 The quote and Tyrion Lannister inspired me to create this one of a kind drinking game. Players battle wits and test their knowledge. 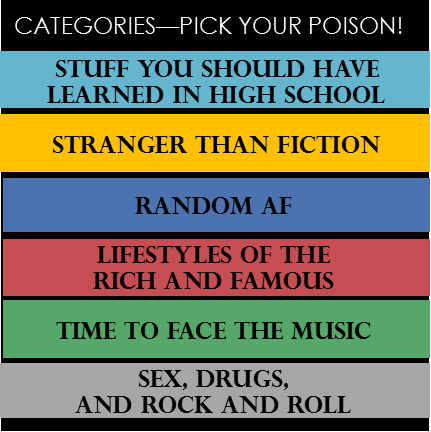 The player who knows the least about each category gets a shot. 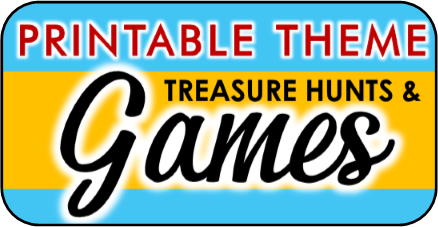 As the game wears on players get more intoxicated, answers get more hilarious, and game play gets more cut-throat. Do you have what it takes to win the game and take the crown - or will you end up just another drunken fool? 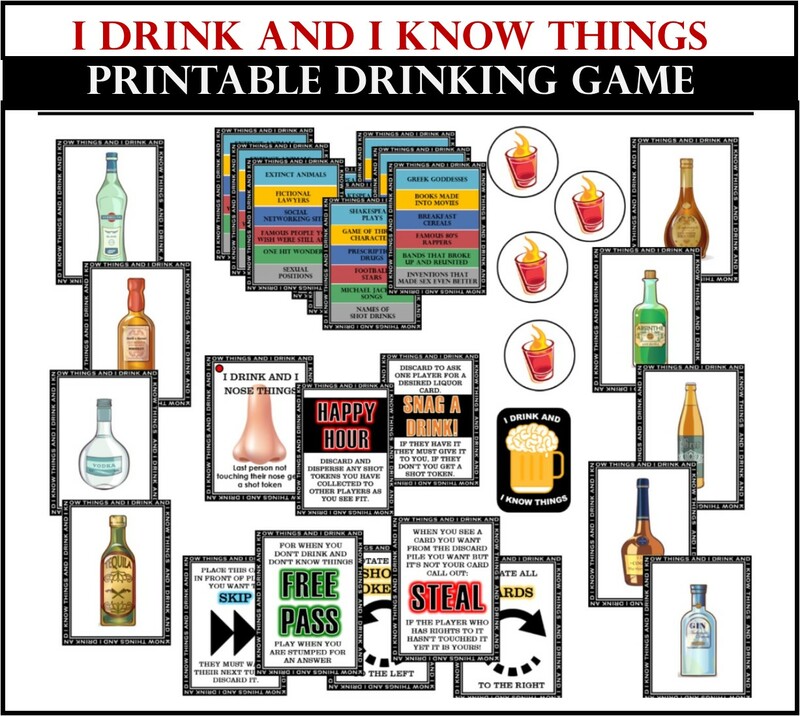 First thing first print out the "I Drink and I Know Things' cards. 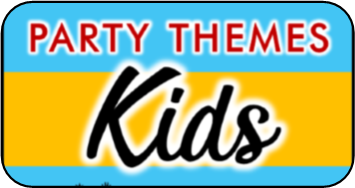 They are available for instant download at the end of this page. 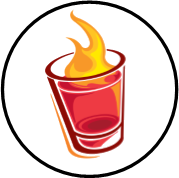 Give every player a shot glass and deal 7 cards. Place the remaining cards in the center of the deck face-down—this is now known as the DRAW STACK. Turn up one card - this is now known as the DISCARD STACK. Place the cut-out shot tokens and official 'I Drink and I Know Things' reward mini-cards off to the side of the draw stack. 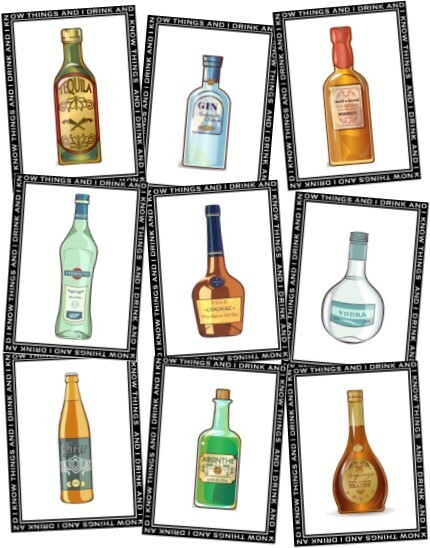 In the deck there are nine different types of liquor cards. Players try and collect sets of three matching liquors by drawing and discarding from the deck. 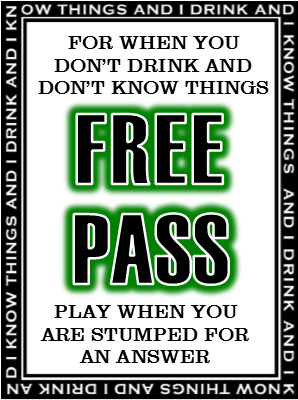 When they collect a set of three they lay them down and collect a 'I drink and I know things' reward card - as shown above. At this point whoever has shot tokens in front of them must consume a shot for every token they have. How do players get shot tokens? by losing challenges from challenge cards - see next. Also in the deck are Challenge Cards. A challenge card has six different categories to choose from. When a player discards a challenge card they must choose a category and name something that fits that category, then the next player clockwise must name something different that fits that category. This continues until a player either does not have a correct answer, takes too long to answer, or repeats an answer already give. The player that fails must then take a shot token. Also found within the deck are Rule cards. These add a little kick to the game and keep it unpredictable. When a player lays down this cards all players must immediately touch and hold their nose. The last player who does this must take a shot token. When a player does not know an answer to one of the challenge categories they can discard a free pass card. The challenge will then pass to the next player, but if the challenge comes back around to the player who played the free pass they will have to answer, play another free pass card, or accept the shot token. 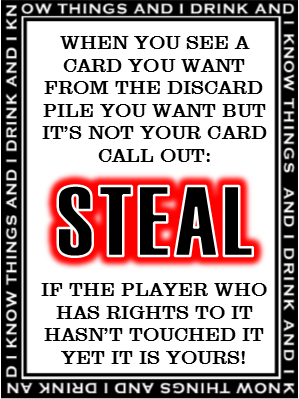 When a player sees a card they want or need discarded when it is not their turn to take it they can use the steal card. They can even use the steal card to take a rule card that has been discarded. They must use the steal card before the next player touches it. 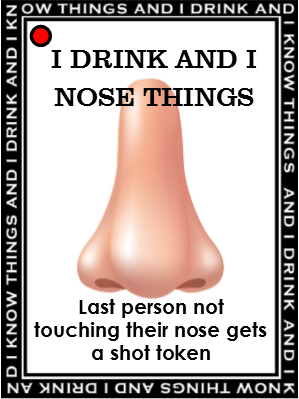 If more than one person tries to steal a card it goes to the first that touches their nose. For a player to steal they must replace the desired discarded card with their steal card. 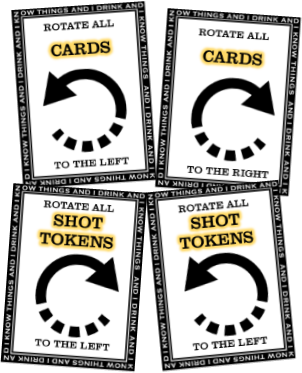 Rotate shot tokens: When a player discards this all players must give their shot token to the player to the left or right (according to card directions). 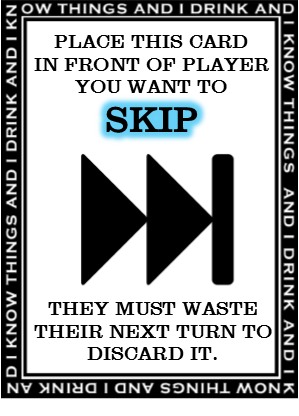 Rotate cards: When a player discards this card all players must pass the cards in their hand to the player to the left or the right (according to card directions). Play starts with the player left of the dealer. That player may draw one card from the discard stack OR as long as the card isn’t a rule card (red dot in the corner) they can take the top card from discard stack. That player must then discard a card so that they, once again, only have 7 cards in their hand. When there are no more cards left in the draw stack then the cards in the discard stack are shuffled and used to replace the draw stack. Play continues according to what kind of card they discard - as discussed above. 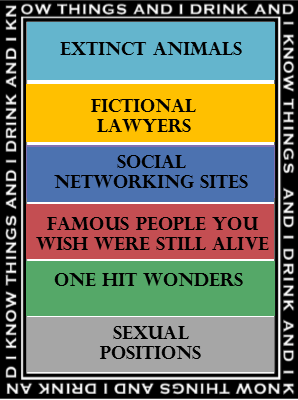 WINNING: The first player to collect 5 'I DRINK AND I KNOW THINGS' Reward cards wins! 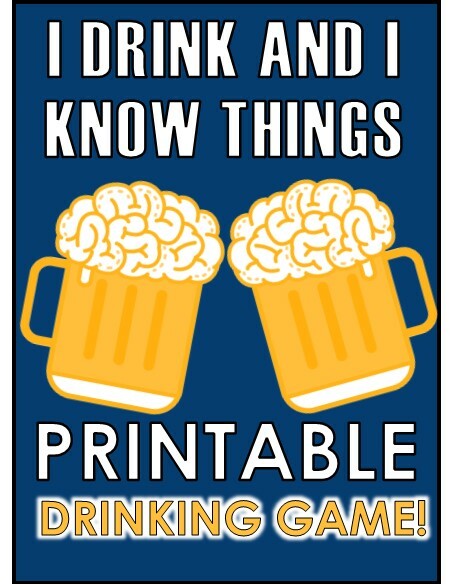 GET YOUR 'I DRINK AND I KNOW THINGS' GAME NOW!